Chop and sauté onions and chicken. Add curry paste and some sort of milk. Add assorted vegetables, serve over rice. There’s a reason I stick to the formula – it’s simple, and generally adequate. When you’re just looking for some Thai red curry on a Tuesday night, why mess with a simple formula? My experience with fish amok, the national dish of Cambodia, turned that on its head. With a few key ingredients in hand, I was easily able to make my own fresh curry paste, with a flavor that was far more layered than the store-bought stuff that comes in a jar or packet. Mix the spices together in a hand blender, then pour into a pan. This isn’t to say my efforts this time were a home run. Somewhere along the line, I had the brilliant idea to deglaze a pan with fish sauce. That was not too wise. By the time we were eating, the first bite was delicious, the third bite was OK, and the 20th was taxing, laborious. It was overflavored, and for that, at least on this go-round, I’ll blame the fish sauce. Regrettably, I didn’t note what websites I used as a source for this recipe, so my apologies. Add the fish to the curry, mixing together. DO NOT DEGLAZE WITH FISH SAUCE. 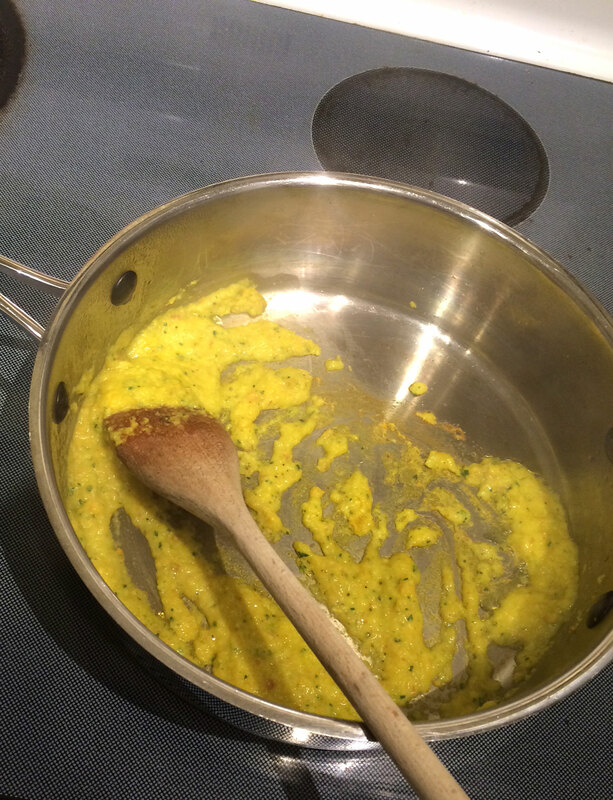 With a hand mixer, combine garlic, chile paste, shallots, lemongrass, galangal, leaves, coconut milk and turmeric. Marinade fish with salt and black pepper. Thinly slice to bite-size pieces. Heat oil in saucepan on medium high. Add curry paste, cook for 1 minute. Add shrimp paste, coconut milk, sugar and salt and combine. Simmer on medium for two minutes. Add the fish, folding into the curry sauce. Simmer 3-4 minutes, or until fish is cooked through. Whisk the egg with fish sauce and 2 Tb of pan sauce. 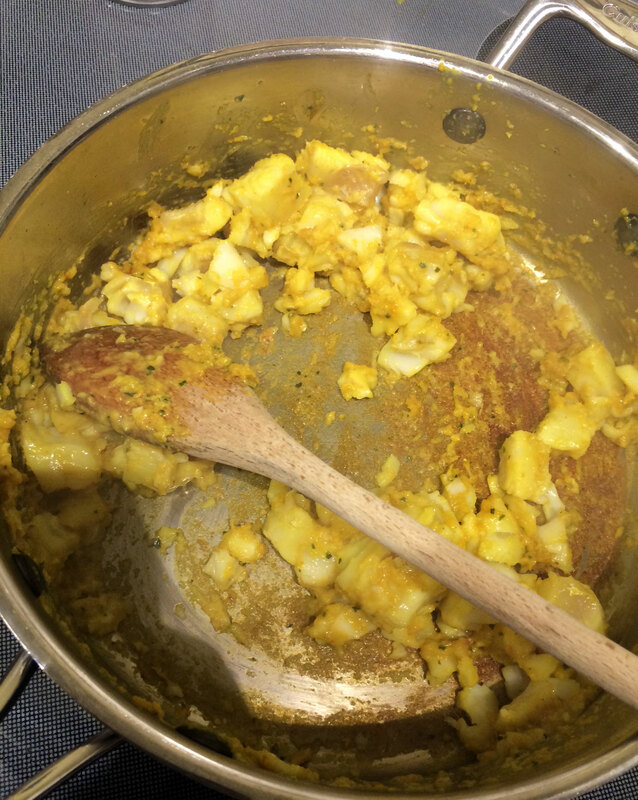 Pour mixture into the pan and fold into curry. Make bowls with the banana leaves. Add a small quantity of rice to the bottom of the bowl, then add cooked fish. 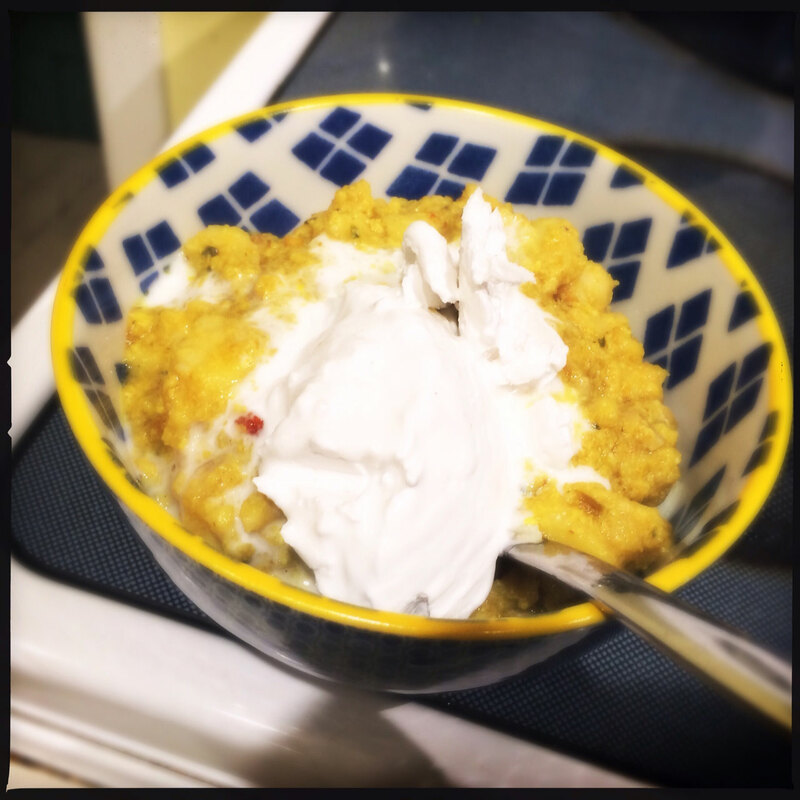 Top with coconut cream. 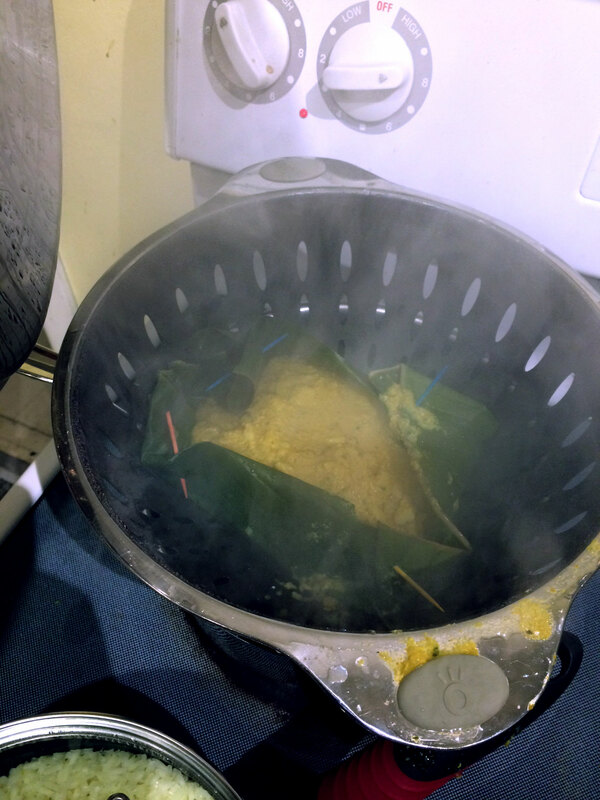 Steaming the fish amok curry in a “bowl” of banana leaves, held together with toothpicks. Step 7 was particularly tricky, folding the “bowls” together with toothpicks in such a way that they were watertight. I wound up just making one larger “bowl” and serving out of that into standard serving bowls. I served the whole shebang with fresh young coconut. Aside from going light on the fish sauce, and maybe adding a skosh more ginger and pepper, this was a pretty tasty meal. Cambodian Fish Amok, served with rice underneath and coconut cream on top.